Philosophers, social scientists, and laymen have used two perspectives in analyzing social action. One sees man's action as the result of causal forces, and the other sees action as purposive and goal directed. Mathematical treatment of social action has shown this same dichotomy. Some models of behavior describe a causal process, in which there is no place for intention or purpose. Most stochastic models of behavior, whether individual or group, are like this. Another body of work, however, employs purpose, anticipation of some future state, and action designed to maximize the proximity to some goal. Classical microeconomic theory, statistical decision theory, and game theory exemplify this direction.This book examines these two directions of work, and makes original contributions to the second. An introductory chapter outlines these two bodies of work, and casts them in a common frame, to display their similarities and differences. 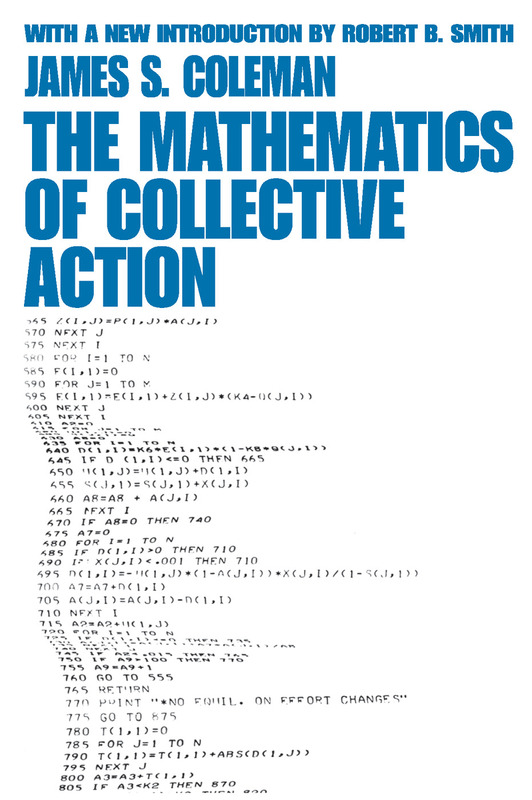 Chapter 2 reviews at length recent work in stochastic processes that makes up the first body of work, which sees social action as the resultant of causal forces. The remaining chapters develop a mathematical framework for the study of systems of social action using a purposive theoretical base. These chapters are designed particularly to contribute to the study of collective decisions, a form of social action that has proved particularly challenging to theoretical analysis. First published in 1973, this became a significant work both in problem solving and in the future career of the author. It is of continuing importance to researchers and students interested in statistical analysis.